Acid-free binders are used to repair paper-backed books when their paper covers are torn, have library or previous owner markings, or just to improve the durability and quality of a book, professional paper, or bulletin. 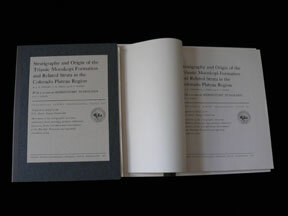 The pages of the original book are placed covered with a new wrap-around acid-free end plate. They are then glued into a acid-free, lignin-free, 60-pt. barrier board with a pH of 8.0 - 9.0. This produces essentually a book in "new" condition. These binders have a blue-grey exterior color with DuraCoat water-based acrylic coating that stands up well to continuous handling and/or long term storage. 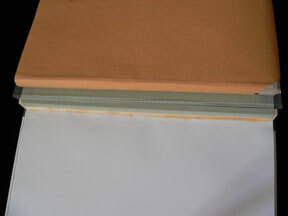 The interior surface color of the binder is white. 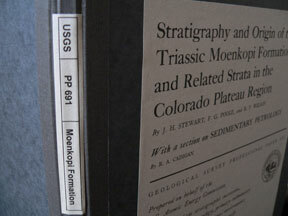 Binders contain a 3% calcium carbonate buffer to preserve the content of any book from deterioration over time. The acid content of paper used in making especially older books leads to the formation of spots having a gray or brown color which darken in color over time. These spots are referred to as "foxing". Eventually these spots can develop into holes in the pages. This is a big problem with books produced in late 1800's and early 1900's, especially if they were stored somewhere with a high temperature and/or moderate to high humidity and/or poor air circulation. The paper covers of many older publications contain higher acid content than the pages inside that book. So replacing those covers helps to lengthen the life of that publication. Today, most new books use an acid-free paper and avoid this problem altogether. The spines of acid-free binders are covered with gray cambric. The adhesive which holds the papers in place is a neutral pH polyvinyl acetate. A book can be removed from a binder at a later date should you wish to have it rebound in cloth. If the original book has separate pocket plates, I place them in a new pocket and attach the pocket to the inside of the back cover of the binder. If this "pocket" is large, I commonly add a small piece of white pine at the spine of the binder for stability. It helps to hold the content in the book straight while it is used or while it sits on a book shelf. I commonly make a large number of 12 different shapes and lengths of white pine "sticks" for this purpose. If archival work needs to be completed on any book, the only tape I use is Filmoplast P archival tape. It is a very thin, transparent tape that is the best way of mending page tears. I stock all colors and weights of paper to mend pages and endplates. When your book arrives, I want to be proud of your new possession. Here is an example of acid-free binders. To the left below a closed professional paper which is holding another paper open. If covers are damaged, I cut the original titles off the paper covers of original publications and glue them to the covers of the binders to preserve as much of the original document as possible. If I can't use the original cover, or if it is missing, I photocopy the cover of another paper and attach it onto the cover of the acid free binder to give all binders a professional finish. Only the covers are sometimes brittle, the interior paper is a high quality paper which seldom has a problem of any kind. This is a veiw of the inside of the rear board of a binder showing the neat seam where the back of the paper was glued into the binder and where a pocket was added containing pocket plates. Here is a view of the spine of a binder. I add a label noting an identification for that book. Making these labels is a never-ending task. I usually put this job off until I have about 1000 of them waiting for a label. If you have one of these without a spine label please accept my apologies. If you need something repaired, you have a special need, or you need custom lables for your binders, please let me know. If you have papers purchased here or elsewhere that you wish to have bound in acid-free binders please inquire. Binders usually cost from $5 to $15 each depending of size and difficulty involved. A cloth binding is much more expensive and commonly costs $ 40 to $ 60 and up for simple bindings. 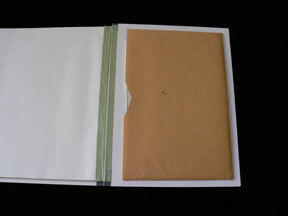 Here is an acid-free binder containing a paper with a large pocket of plates. Note the custom cut white pine strip neatly added to help stabilize the new large book. My name is Mel Schmidt, I am the owner of the Company. I do all the archival work on location. If you have books which could use some tender archival care please let me know. I do not bind books with hard covers.